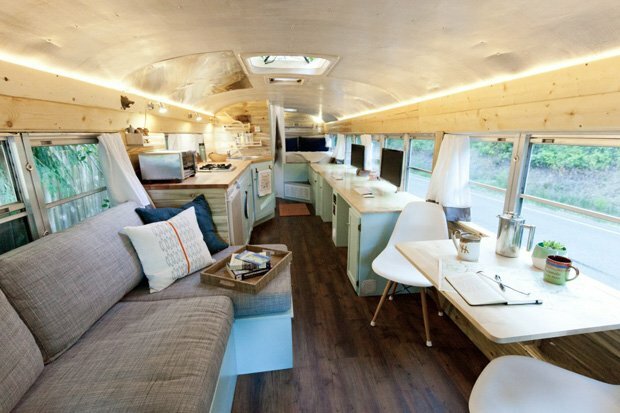 Here’s an awesome way to combine work and adventure! As Will and Alyssa have proven to themselves and to their friends and clients, you can work and meet your clients’ needs without missing a beat and at the same time indulge in your passion for the outdoors. 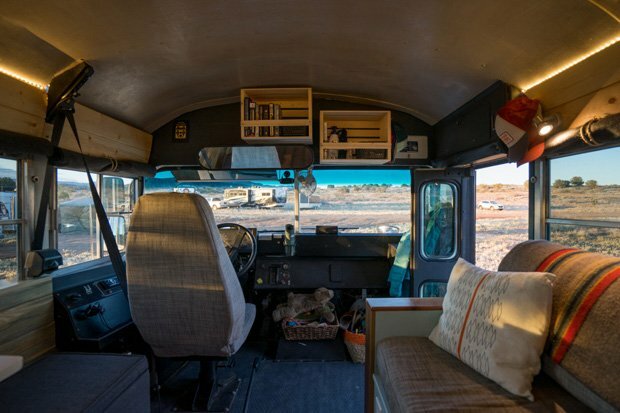 All that (and more) was made possible when they decided to quit their 9 to 5 jobs, start their own tech-consulting business, and purchase and convert a 37-foot school bus – christened ‘Outside Found Bus’ – into a “tiny house” on wheels. This started the couple, together with their dog Hilde, on an amazing adventure on the road, working from “home” and enjoying the ride and the journey itself, seeing different places while doing the kind of work they love doing. A couple of years have passed and they are embarking on a new chapter in their life together, having found an ideal place to settle down and put down some more permanent roots. 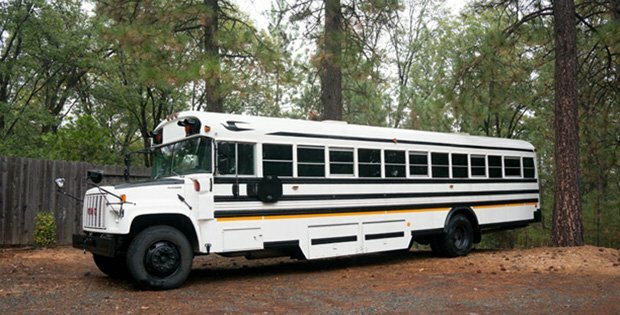 With that they’ve put up the Outside Found Bus for sale at $64,500 Now take a look at these photos and tell us what you think on our Facebook Page! It’s been a whirlwind few years for us at Outside Found. Almost exactly three years ago, we hopped on a plane out to California to buy our soon-to-be bus conversion from a couple we found on Craiglist. Six months later we were neck deep in construction, finishing up a few months later. We travelled all over the Western United States, exploring Washington, Idaho, Montana, Wyoming, Colorado, Utah, and Arizona. We’ve documented the best of our experiences here on our blog. . . . 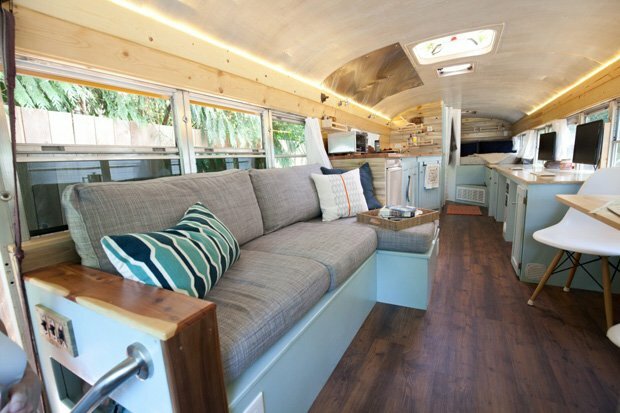 This beautiful, open concept, school bus conversion is the perfect combination of comfort, utility, character and charm. 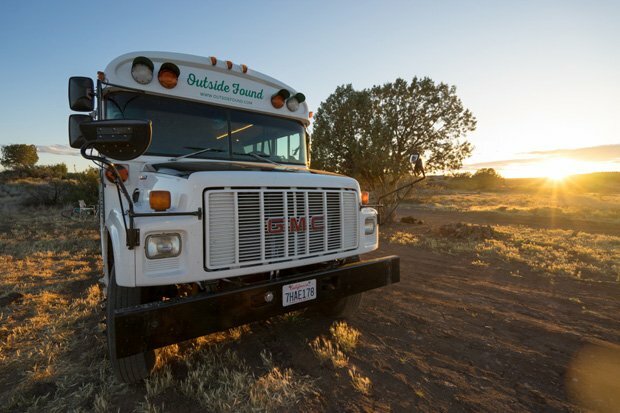 Rugged tires, tons of clearance, massive water and propane tanks, plenty of solar power and a garage for your outdoor toys will help get you to your next adventure while the huge couch, spacious kitchen, built in heater, bathroom with toilet and shower, unobstructed views will keep you cozy while you recover after. It’s hard to imagine a more comfortable home away from home! [FOR SALE] Cute Little Cabin With a Vintage Vibe for $85,000!